The Westland Westbury was a twin-engine fighter prototype of 1926. Designed by Westland Aircraft it never entered service but played a useful role in the testing of the C.O.W. 37 mm gun. Only the two prototypes were completed. In 1924 the British Air Ministry issued specification 4/24 for a twin-engine home defence fighter, to be employed to defend Britain against night attacks by enemy heavy bombers. The aircraft had to have a top speed of at least 125 mph (201 km/h) and a landing speed of not more than 50 mph (80 km/h). In September 1925 the Air Staff amended the specification to specify the use of the 37 mm C.O.W. gun and supercharged engines. From the design proposals submitted by the manufacturers, two types were selected for prototype development, the Bristol Bagshot and the Westland Westbury. Two airframes were ordered from Westland, allotted serial numbers J7765 and J7766. The Westbury was a twin-engined three-bay biplane of conventional layout, large for its day irrespective of type and remarkably so for a fighter. The first prototype, J5565 was of all-wooden construction, while the second, J7766, had a mixed construction wing with a duralumin mainspar and wooden ribs. All surfaces were covered with fabric. The wings were of equal span, with three pairs of struts on each side and wire bracing. The fuselage was deep, of rectangular cross-section, and had a blunt nose. The crew of three had open cockpits in the nose (front gunner), in front of the wing (pilot) and aft of the wing (rear gunner). The landing gear was fixed. The 450 hp (340 kW) Bristol Jupiter VI air-cooled radial engines were installed without C.O.W.ls on nacelles that were attached on top of the lower wing, at the innermost pair of struts. Each drove a two-bladed propeller. The first aircraft J7765 was delivered to the A&AEE at RAF Martlesham Heath in 1926. J7766, delivered the following year, was distinguished by having engine nacelles that extended aft of the trailing edge of the wing, the wing with duralumin spars and a metal-covered wing centre section, and a more rounded nose shape. The modified nose and nacelle shapes were also introduced on the first prototype. Although the Westbury was judged to have good flying characteristics, and the competing Bristol Bagshot monoplane had serious structural problems, it was not put into production. It was clear that the performance of the Westbury was insufficient to make it a useful fighter aircraft. However, it did serve for several years as an armament trials platform, mostly for the 37 mm C.O.W. (Coventry Ordnance Works) gun. The Westbury could be fitted with defensive Lewis guns on a Scarff ring position on top of the fuselage, aft of the C.O.W. gun mounting, and in a ventral mount. Its most important gun mountings were in the nose and immediately aft of the wing, and had special fittings for the much larger and heavier C.O.W. guns. The C.O.W. gun mounting in the nose was of Westland design, and allowed the gun to be trained over a wide arc. It supported the gun on the apex of a pyramidal structure, that was asymmetric to allow the gunner to have easy access to the weapon. This structure was fixed on a rotating base, which also provided the gunner with a rotating platform to stand on. The gunner could train the mount by turning a hand gear, or push on a pedal to engage a brake that locked the mount in its position. The elevation and depression of the gun were accomplished by the muscle power of the gunner. As the large ammunition clip of the C.O.W. gun prevented sighting over the barrel, a sight was installed to its left. The gun is reported to have been successfully fired in the air, also when trained to the side. The rear C.O.W. gun mounting was installed immediately aft of the wing, in a fixed mount that only allowed for a limited adjustment of the angle. A special sight for this gun was installed in the pilot's cockpit. This armament would be aimed by the pilot from a position below the aircraft attacked. The first firing trials resulted in several broken wing ribs, and a special rubber-spring shield was developed to protect the upper wing. The first prototype Westland Westbury, registered as J7765, photographed late 1927. The second prototype Westland Westbury, registered as J7766, with a modified nose. Photographed May 1927. The rear 37 mm C.O.W. 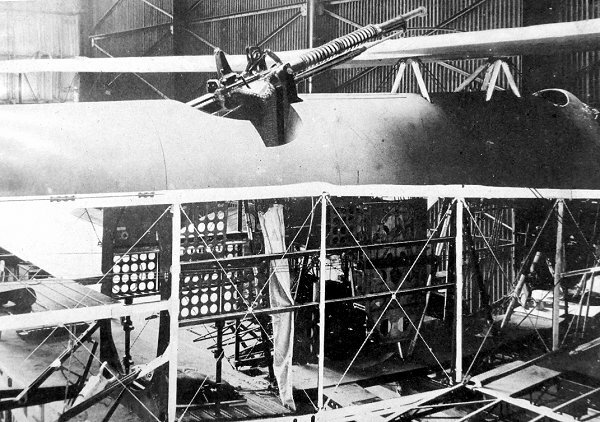 gun mounted in the fuselage during final assembly.